Lincoln was once again host this weekend to some of the finest junior high boys basketball players across the state of Illinois for the second annual All-State Junior High Classic. Practices were held all over gymnasiums in Lincoln with games taking place on the campus of Lincoln College. Twelve teams competed featuring 142 players. Only two athletes from East St. Louis were unable to attend due to weather conditions on Sunday. Kirk Whiteman, who organizes the event along with David Kasel, was once again pleased with the success of tournament that features teams playing three games apiece. The high level of competition was coached by junior high coaches from all over the state. "We had some really quality people," said Whiteman of the coaches. "It's just a great way for the players to end their junior high careers. "It was a great weekend celebrating junior high kids finishing their junior high career and moving onto high school and bigger and better things in life. This was also an opportunity for them to come in here and showcase their skills and get to know some other people. They had a really great time. 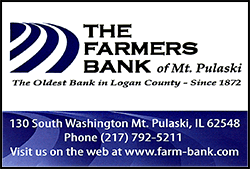 "I would really like to thank the Lincoln Tourism Bureau that helped put this on. We had a lot of hotel nights and we worked with Shawn Taylor out at the Bowling Alley and Chad Batson at Stuffed Aria. Chad gave coupons to the kids. Hopefully those guys did well, too. It was just a great weekend," said Whiteman. 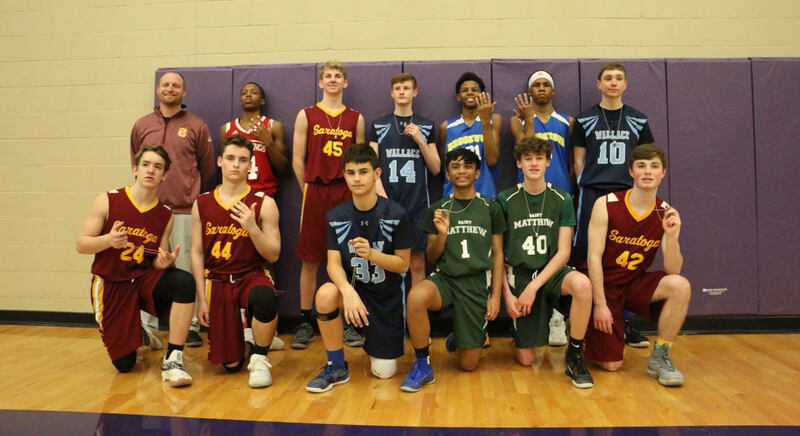 Most of the athletes participating in the All-State Junior High Classic are eighth graders but there were a few seventh grade players on the rosters. Representing Lincoln on the Central team coached by Terry Biggs of West Lincoln-Broadwell were: Jake Bivin (WLB), Trey Schilling (WLB), Jacob Langley (WLB), Cadge Kingsley (WLB) and Tyler Sasse (CEL). The weekend kicked off on Saturday night with skills competitions. Champion ~ Ryan Hendrickson (Champaign St. Mathew) Hendrickson made eight threes in the final round to win. Runner-Up ~ Jake Stewart (Washington Middle). Sunday featured games held in the Old Gym at Lincoln College and in Lincoln Center at Jack D. Nutt Arena. 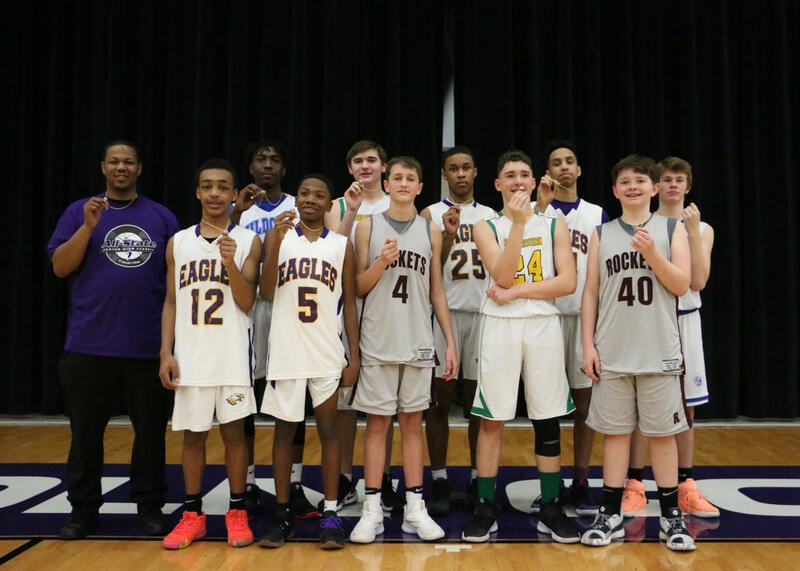 The West Team won the 2019 All-State Junior High Classic with a 58-56 win Sunday night over the Northeast Team. Throughout the day there were some close games, some blowouts and even a buzzer-beating three that put the Northeast in the championship game versus the West. It was clear by Sunday night the players were tired from all games, but the smiles proved that coaches and players alike had fun. This year, the championship team was the West Team - led by Coach Darryl Moffett. 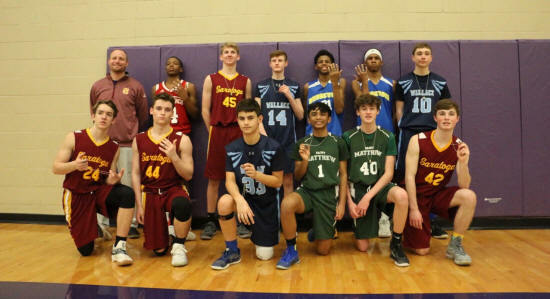 In the team photo from the left: Coach Darryl Moffett, Jase Whiteman (Taylor Ridge Rockridge), Elijah Ferguson (Taylor Ridge Rockridge), Lane Gage (Piasa Southwestern), David Watkins (Piasa Southwestern), Cross Merritt (Monmouth ISC), Xavier Sulaiman (Matteson Colin Powell), Josiah Harris (Matteson Colin Powell), Devin Davis (Matteson Colin Powell), Leirre Collier II (Matteson Colin Powell) and Shantez Holliday (Lovejoy). Darryl Moffett, coach of the winning West Team, said after the players received their rings, "It was quite an experience and I really enjoyed it. I liked the fact that I was able to get a few more players that I didn't know. We worked out for one day with one practice and they liked me and I liked them. It just all worked out"
The hustle and the athletic ability by these eighth grade ballplayers was impressive to watch as they unselfishly played the game. Moffett agreed. "We had one practice and in that one practice I told them we just have to pass and cut, share the basketball and when it's your turn to turn, make the corner, make the layup or shoot a pass to someone. They did it. They really ran it to perfection so I couldn't be any prouder of these ten guys," said Moffett. Some of the athletes from the bigger schools are still undecided about where they will be attending high school. It's pretty competitive around the Chicago area for these kids. 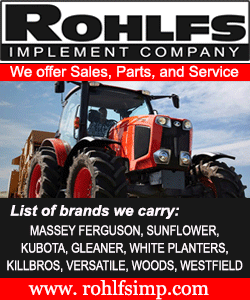 "I would love to see where all of them end up," said Moffett. "Some of them told me the high schools they are going to go to. I want to follow them. You know I'm not done with them. Even though I just had them for a weekend, we all clicked. I am going to catch them in high school and see how good they turn out to be." Leirre Collier II is an eighth grader from Matteson who played for Moffett this weekend in Lincoln. "It was a great experience and I built a lot of friendships with new people," said Collier after the championship game. "It was a lot of good competition. It was very hard to plan but we did good and I am glad we won the championship. One practice and it clicked," he smiled. Collier plans on attending Marist High School in Chicago. Xavier Sulaiman is also an eighth grader from Matteson who played for Moffett in the tournament. "The weekend was a fun experience," said Sulaiman. "I had a lot of fun moments. A lot of laughs. We played team basketball through the whole weekend and it was very good for everybody." Sulaiman is undecided at this point about which high school he will attend. Darren Ames Jr. from Parker Jr. High in Homewood was on the Northeast Team that got second place in the tournament. "It was good," said Ames despite the 58-56 loss. "I learned a lot from the coaches about moving the ball around and scoring. It was fun and I met a lot of friends too." Ames is quick and has a nice shot that kept his team in the game Sunday night. Ames is set to attend Homewood Flossmoor High School. The first runner-up team was the Northeast Team led by Coach Vince Zomboracz. Team photo left to right: Coach Vince Zomboracz (Morris Saratoga), Brett Hardy (Glenwood Brookwood), Darren Ames Jr. (Homewood Flossmoor), Trace Roether (Ottawa Wallace), Bryce Sharp (Ottawa Wallace), Jack Amiano (Morris Saratoga), Luke Brown (Morris Saratoga), Ashton Yard (Morris Saratoga), Jonah Williams (Morris Saratoga), Payton Knoll (Ottawa Wallace), Martin Mondala (Champaign St. Mathew), Jordan Brown (Glenwood Brookwood) and Ryan Hendrickson (Champaign St. Mathew). Vince Zomboracz was the coach of the Northeast Team and he's also a teacher and coach at Saratoga School in Morris. "It was a lot of fun," said Zomboracz of the tournament. "Overall it was nice to see all of the talent in the state of Illinois at the eighth grade level. It's unbelievable actually. On a personal level, I got to bring four players from my eighth grade team. One was even more special. My one player broke his ankle during football but he only played five games for me this year and never got back for regionals, so that was kind of a tough blow. So it was nice to be able to bring him and coach him again, as well as the three other boys, because they are a special group. They won a regional championship as seventh graders and because of all the injuries this year they weren't able to repeat that success, but it was kind of nice to bring those boys here. It was nice to see all the talented eighth graders and get to know some kids from different areas. Now I can be their fans." We all can. All in all it was a great weekend for some outstanding young basketball talent in Lincoln. Below are the final standings from the tournament.